The White Rabbit Gallery, located in the inner city suburb of Chippendale, is one of the largest and most significant collections of contemporary Chinese art in the world. It closes twice a year for the installation of new exhibitions. For those of you who don’t live in Sydney, we’ll try to visit at least every six months so that we can share this glorious treasure with you. If you do live locally, please understand that these photos don’t begin to do the artworks justice. I highly recommend an in-person visit to the gallery – they’re open Thursday to Sunday and, astonishingly, admission continues to be completely free. Here are the highlights from our most recent visit. These shots were taken with my iPhone and were somewhat limited by the low lighting. In addition, there are several audio-visual and dynamic pieces which simply couldn’t be captured in still photos. If there is one piece worth visiting the exhibition for, it’s Mini Home (2005). Artist Jin Shi recreates in half scale the home of a poor urban migrant couple – peasants who have come to the city in search of a better life only to find themselves trapped by the system. It is heartwrenchingly small, especially when you consider that the real “house” was only twice as big. According to one of the knowledgeable White Rabbit guides, the couple who lived in the space would take turns to sleep, with one sitting outside while the other rested. At the bottom left is a very basic lavatory, and all components of the artwork – down to the cups, saucers and television – have been reproduced at half scale. Bai Yiluo’s Illumination (2011) is a collection of antique oil lamps, an item which was commonplace in Chinese homes before electricity. 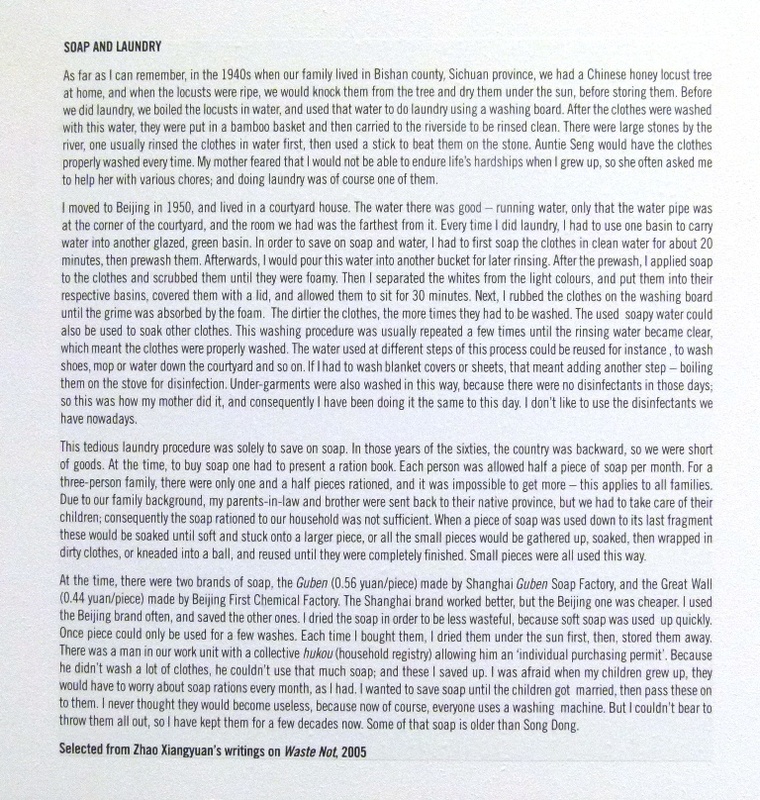 It made me ponder how quickly items which we consider to be essential can become obsolete, and reminded me of Zhao Xiangyuan’s collection of soap in Song Dong’s Waste Not exhibition. By contrast, artist Zhou Jie had very strict instructions for the layout of her porcelain city, titled CBD (2010). Each piece arrived at the gallery beautifully packaged, numbered, and with clear directions for placement. The artwork reflects the layout of Beijing’s new CBD, supposedly covered with pathological organisms to highlight the spread of buildings like viruses, and expressing the artist’s concern about urban growth. As the gallery doesn’t charge an entry fee, we try to support them by buying something whenever we visit. This time we picked up a couple of their postcard books from the current exhibition (Roz, I have a copy for you). The Smash Palace Exhibition will be on display at the White Rabbit Gallery until August 4, 2013. If you’re in Sydney, it’s definitely worth a visit! Smashing gallery, Celia. Very inspirational. I can see why you go back. Recently saw an installation of clock movements on the white flooring, with a little pencil lead attached to the ticking hands. Which drew a repetitive circular image as it progressed through time – to be in place for a month. Beautiful and strangely fragile, probably due to the changeability. The curators wouldn’t allow me to take a picture though. Aren’t you lucky to be able to photograph. Gill, what we’re really lucky about is that a gallery of this calibre offers free entry! I always feel so blessed to be in Sydney and have so much contemporary art on offer at no cost! Hahaha!! Sounds very cute, Tania, did you buy it? Your art gallery posts have really encouraged me to try and get the kids and I along to one soon – and this looks amazing. Thanks for making it feel so accessible. Thank you so much for taking the time to read and comment, Claire! I probably spend more time on these posts than others, because I so love the artwork and would hate to not do them justice when I write about them! Great post Celia! I love your blog, really diverse and always interesting. Thanks! Oh! I can’t believe this!! Shall share with quite a few Sydney gfs as much into modern art as I am!!! Was this the Gallery to which you took Debra Kolkka when she was in Sydney? I have a long list of restaurants and shops I want to visit next time I get out of my rural nest, but this just has to come first!!!! I remember going to Japan and HK in the years past and using every connection we had to get stuff which was not supposed to leave the country back to Australia: just could not leave that kind of talent behind – oh my, these are fabulous!!!!!! I love the red exhibit- at first it looked liked red letuces and cabbages. I must me hungry? Thanks for taking us along on your visits to museums, Celia. It is such a different venue than my day to day! How wonderful Celia! I want to recreate that first work of art in edible form! Sure! The tea house there is very nice too! Have you been before? Incredible Celia, this art almost looks like it is from another world. Actually, it is another world! Thank you for sharing these wonderful things. City life offers some amazing experiences doesn’t it? 70kgs!! Insane!! Must be a very tough and handy wall to be able to hold up such weight. I would love to come back to Sydney and visit the gallery with you. This is another exhibition I could easily get lost in, Celia. I can see why you would return to Mini Home several times. It’s fascinating.The piece showing the gold-faced peasants waiting is another that would entrance me. Thanks you so much for taking us along. You take us on the best field trips! Amazing and beautiful works of art, thank you for sharing, especially for those of us not in Sydney. I’m so glad you blog about many other things you love and that enrich our lives. You are very inspiring, Celia! What a powerful exhibit. I want to go. I’m smiling over the “French Jump Rope” or “Elastics” as you called it. When I was a girl in the early sixties we called it “Chinese Jump Rope” Now I want to find out where it originated. Keep the adventures coming! Maz. I SO want to go to see this gallery. I love the little house and that porcelain is amazing. Celia, I went to this gallery for the first time recently and really loved it! Thanks for your overview it was great seeing all those works again through your eyes . I went with a friend and we decided to make regular visits when the program changes.